The practice of circumcision, known as ‘khatan’ in Malay language, is one of the oldest practices still observed today. Primarily practised among the Muslim community in Southeast Asia, circumcision is a rite of passage which marks a boy’s transition into adulthood. Beyond that, it is also an event that brings the family and neighbours together to celebrate a boy’s first milestone of stepping into manhood. In cities, you can see neighbours share a rare moment of camaderie over these ceremonies. This photo series by Nafise Motlaq follows a family of seven in Sentul, whose three young sons were to be circumcised during a school holiday. The mother prepares her three sons for the ceremony. 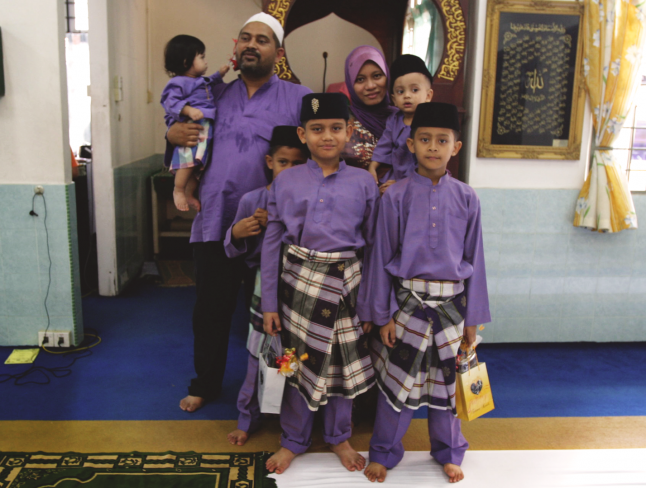 The entire family donned the same colour, purple, to symbolise their unity. 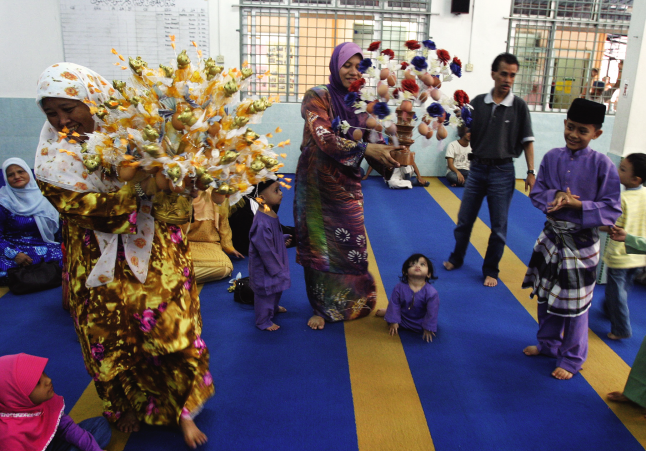 Mothers of the boys carry ‘bunga telur’ to the surau as a symbol of fertility. After the circumcision is done, the families throws a feast for the neighborhood to celebrate together. The Imam retells the story of Nabi Muhammad and the origin of circumcision to the boys before they enter the surgical room. 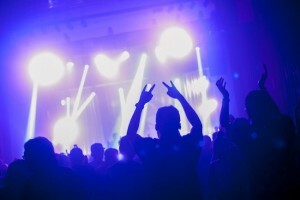 This is a private session done without the presence of the family in the hall. 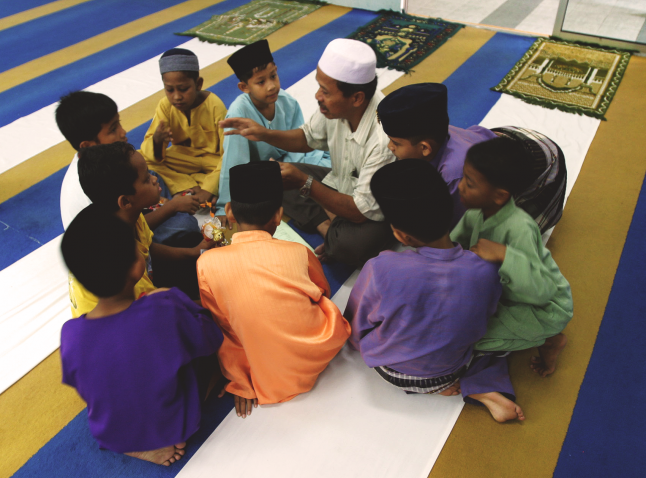 The middle child prays fervently at the surau as the Imam prepare the boys with a sermon. 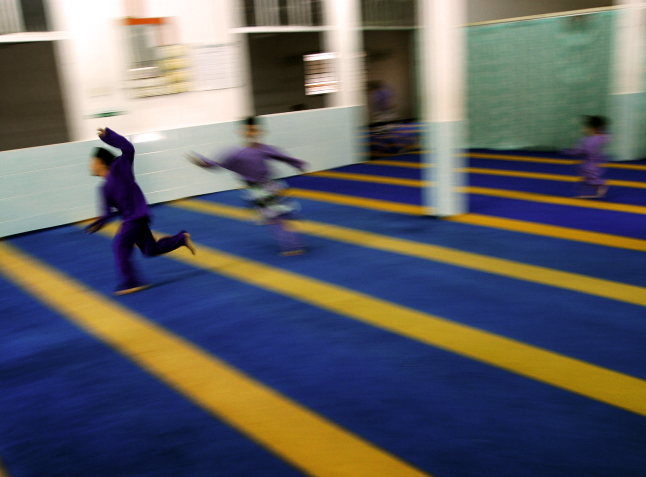 The boys play while their family prepares feast outside the surau. The youngest son has a sudden panic attack after one of his brothers whispers something scary to him before they go to the nearby clinic for circumcision. The boys wait in anticipation, while one of them tries hard to listen on what is going on in the room. Their neighbor’s son had gone in before them. Finally, it’s the middle son’s turn but it isn’t as daunting as it was deemed to be. Today’s circumcision technology involves the use of laser which is relatively quick and painless at the point of surgery. A portrait of a young family observing a tradition that has been practiced for centuries. 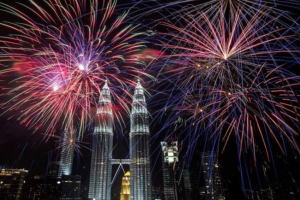 Despite living in the city, traditions like this will continue to be a significant part of the Muslim community in Kuala Lumpur. Nafise Motlaq is an Iranian journalist and photographer who has been living in Malaysia since 2004. She has published a photobook titled “A Given Path” which documents the lives and customs of Muslim, Buddhists, Christians and Hindus living in Malaysia. Nafise is currently pursuing a PhD in Mass Communication at University Putra Malaysia. Find more of her work at www.nafisemotlaq.com.